It's funny how certain stories stand the test of time. Aesop's Fables are stories I remember reading with my Nan and I've still got my book full of those fables at home. My seven year old recently done some work on these tales at school, she had to pick her favourite fable and write a review about it, my book got dusted off and it was so nice to see a new generation getting to experience these old tales. It must have been fate when I recently received a lovely book in the post, Town Mouse, Country Mouse is one of those stories that has taken on a classic story in a way that will capture a new audience. It is a book that has cleverly been combined with lyrical text and enchanting illustrations with an added peep-through element that really captures young children's attention. Rediscover Aesop's classic fable with this rhyming peep-through picture book. Richard Jones' charming illustrations perfectly capture this reimagined tale of two mice looking for their place in the big, wide world. This tale sees two cousins swapping their homes and lives for a little while, a holiday from their day to day goings on but what they expected and what they are actually presented with are two entirely different things. I find that there are two elements to this story. The first is showing the differences in our worlds. How one person lives isn't how another does, the varying environments, from the people and what they do to the buildings, vehicles and noises that surround them. What this does is show little ones that it is ok to want to explore, to discover new things. The other thing that this story manages to do is bring across a moral element. What I like about this kind of thing is that everyone will have their own take on the lessons learned from reading such a story. I always think with this one that you come away feeling like you should be grateful for what you have, having something more isn't always better. Home is where the heart is as they say. 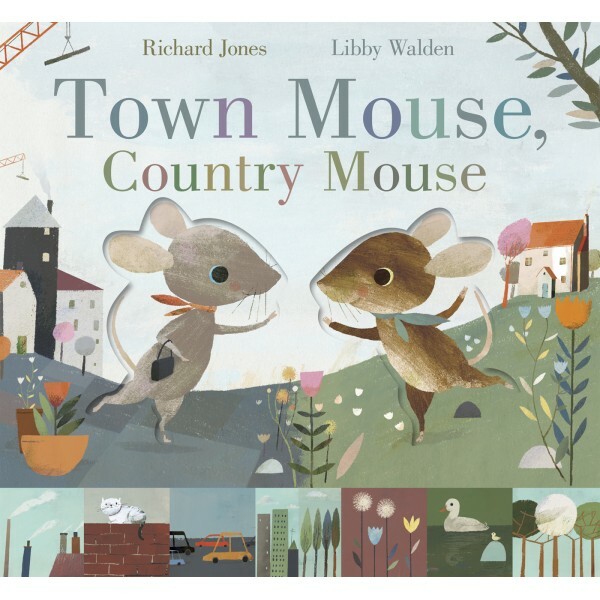 Town Mouse, Country Mouse is quite a simple picture book, but I think it is its simplicity that manages to capture little ones imaginations. The illustrations are drawn in a lovely palette, quite understated but oh so cute and the rhyming words almost have you singing them as you turn the pages. It's a book that appeals to a vast age range. Young children will have enormous fun peeking through the shapes left open on the pages, a sort of peek-a-boo element and those slightly older kids will get the chance to learn as the read, an opportunity to really think about the world around them. A lovely edition of an utterly classic tale. How lovely! This is definitely a story I remember from childhood, although I'm not sure my own children have read it! I have a vague memory of reading this book in school when I was little. I love the artwork.